Oh my, what a mistake-a to make-a. The problem with consuming comics in a non-serialised scattergun way, is that sometimes that scattergun can spectacularly backfire on you, resulting in you coming away from a particular volume with a nasty taste in your mouth. I've been trying to gee C up to get ready to go and watch the MCU's awesome "Captain Marvel" film and noticed "Civil War II" on offer on ComiXology. So yes, I have no one but myself to blame for this one. 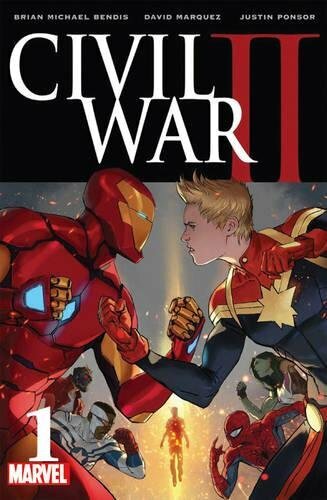 Civil War II is the follow up to the original Marvel Civil War comic by Mark Millar, the first volume to set superhero against superhero, against the backdrop of dovetailing comic series all leading to a singular moment in the Marvel Comic Universe. This time it's all about one's perspective of interpreting future events as we find the key Marvel heroes facing off against each other over a particular mutant supe who can foresee the future. Ths time Tony Stark and Captain Marvel are at loggerheads as TS believes that the visions are subjective at best, while Captain Marvel takes them at face value, believing the only way to prevent the horrible things that happen in the visions from actually happening, she and her team must take direct action. Action that often involves imprisoning, or in some cases killing other supes. 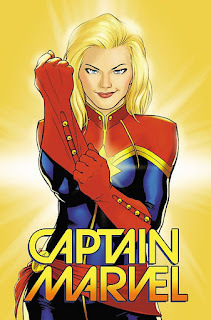 I meant this as a way of getting C up to speed with Captain Marvel, before coming to the horrific conclusion that everyone who reads this comes to - that Bendis' depiction of an awesome superhero (Captain Marvel) is flawed, and that Carol Danvers comes across as a colossal a-hole, whichever way you fall in the Stark vs Cap Marv debate. Not quite the character introduction I imagined!! Oops! 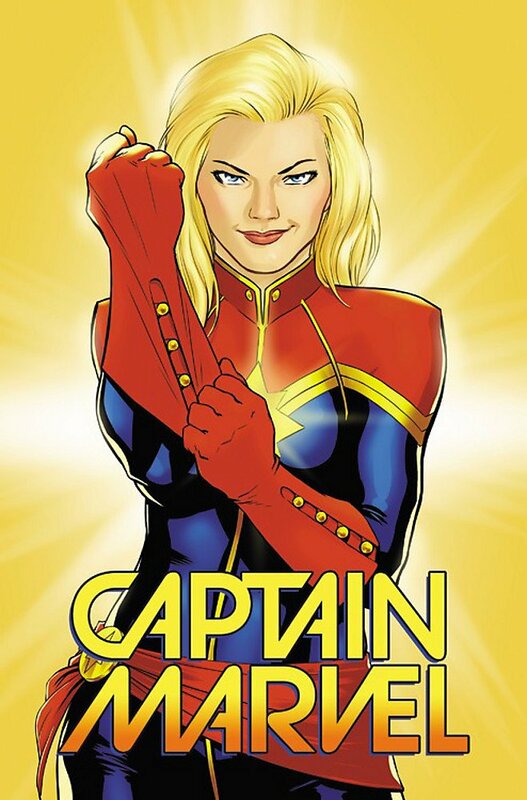 So it was swiftly rectified by diving back to ComiXology to instead hoover up one of the greatest sets of "Origin Stories" comics created for Captain Marvel, from the hugely talented team of Kelly Sue De Connick and David Lopez, who really give us the "Higher, Further, Faster, More" supe we deserve. This is far more what you're after if you want something that previews the version of Carol Danvers / Captain Marvel that appears in the movie. Touching on her origin story but going on to adventures above and beyond as Captain Marvel becomes a deep space adventurer, fighting against the Galactic Alliance and generally being a total badass. So don't make the same mistake we made, opt for this book but treat Civil War II as an abject lesson in what happens to a beloved supe when someone's given a free reign at making them completely and utterly unlikeable on any level . Either way, both are worth a read particularly the former if you can hoover it up cheaply, just for curiosity's sake if nothing else. "Civil War II" and "Captain Marvel" are both out now, published by Marvel Comics (self purchased, not provided for review).